Tracy graduated from Curtin University in 2009 with a Bachelor of Physiotherapy. Since this time she has worked in private practice clinics in Darwin and Wollongong, before joining Flex Out Physiotherapy in 2016. Over this time, Tracy has built up a broad knowledge of musculoskeletal presentations and gained experience working with sporting communities including AFL, netball and tennis. 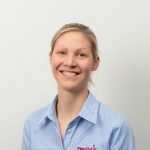 Tracy also has a particular interest in Women's Health including pelvic floor rehabilitation, management of incontinence along with ante and post-natal management. Tracy is trained in dry needling and clinical pilates, completing levels 1 and 2 with DMA. Outside of work Tracy has a running background and now competes in triathlons. Tracy has a specialist interest in treating runners, triathletes and sports specific injuries along with post-natal women who want to return to exercise and running.